Our guest reviewer Mellow Mummy has been feeding her brats delightful bundles of loveliness these exciting character meals from the Crosse & Blackwell 4 Kids pasta and meatball meals - find out what they thought of them. As someone who normally feeds the same food to everyone in the family, a special tin of character pasta is always a very special treat for my eldest daughter who gets extremely excited when I let her choose her own tin of character pasta. These new 4 Kids Pasta Shapes in tomato sauce from Crosse & Blackwell feature some of her favourite characters - Winnie the Pooh, Disney Princesses, Tinkerbell and Cars are all favourites in our house and at 49p they are a bargain. I found the shapes of the pasta very floppy and barely recognisable (crowns and bows for the Disney Princesses, spanners and wheels for Cars) and I felt that the sauce was quite runny but to be honest, it doesn't really matter what I think! My daughter loves them. In fact, on the day she first tried them, she ate an entire tin and then disappeared into the kitchen... I found her a few minutes earlier having rummaged in the cupboard and opened up the next tin of pasta. She was ready to eat them there and then, cold, from the tin! The pasta shapes have slightly less sugar in them than one of our current brands of character pasta in tomato sauce. My daughter has also tried out the 4 Kids meatballs meals - I don't think she had ever tried anything like them in the past. These larger tinned meals feature meatballs in either tomato sauce (a hit), onion gravy (not a hit), gravy or bolognese sauce. 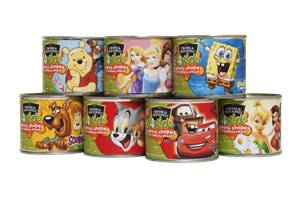 The tins all feature Scooby Doo characters and look bright and fun. I have great memories of meatball meals as a kid myself so I'm glad that my daughter enjoys some of these tinned meals. For me, these are great value (79p) that I can keep in my cupboard for days when I want to serve something quick and easy for my girls while still winning 'fab mummy' brownie points.